I love the holidays. I’m one of those people who cranks up the Christmas music, bakes cookies, and does all that general cheeriness business that irritates some people. I don’t care — I’m a loud-n-proud Christmas dork. I do draw the line at egg nog, though… yuck! Another part of the holidays that I don’t really look forward to is wrapping holiday gifts. It’s not that I don’t enjoy the act of creating pretty presents — my cats just don’t always make it easy for me to create those pretty presents. Plus, I live in a small apartment, so surfaces are hard to come by. In other words, the cats are at the ready with “helping paws” no matter where I choose to spread my supplies. I just finished wrapping and boxing gifts for my family in Florida, and, as expected, Cosmo and Phoebe were busy little elves. 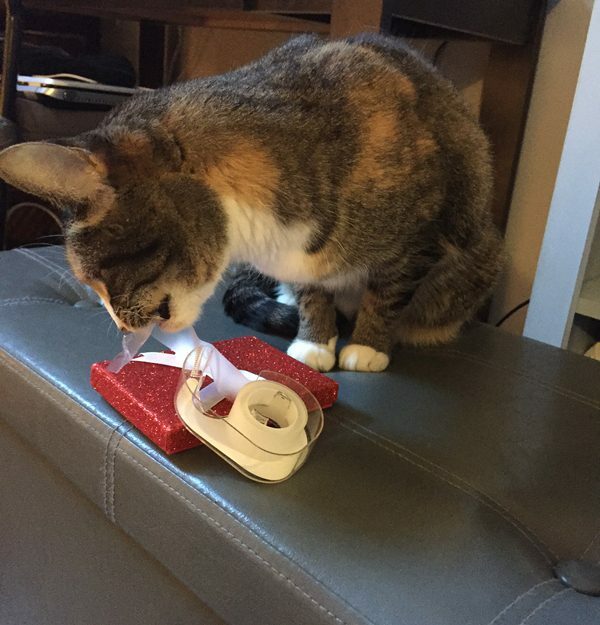 Here are five ways they hindered my holiday gift-wrapping efforts. I’m sure you can relate. 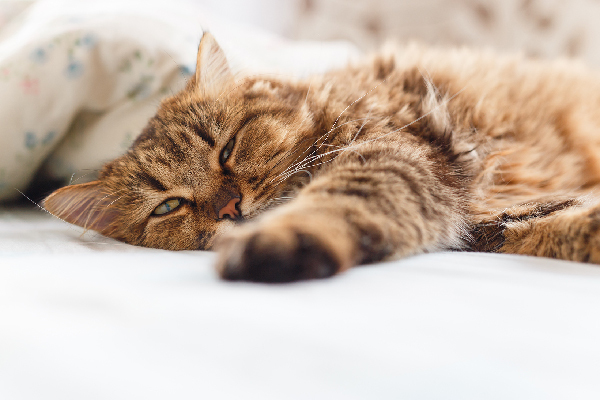 It’s no secret that cats like to lie on top on “stuff.” This includes anything from stacks of paper to a tiny Post-it Note. It makes total sense that they’d be all over a layer of paper spread across the floor. I swear Cosmo galloped to the wrapping paper the second he heard the crinkling of its unrolling. Then he immediately found a spot to settle. Where was that spot? Right where I needed to be, naturally. Of course I removed him, but he immediately returned. There must be some scientific law that explains that attraction. If you find it, let me know. Phoebe creates yet another sticky situation. Phoebe has always been a notorious tape-chewer. In fact, she loves all things sticky. I have to toss stickers and Post-It Notes in a wastebasket behind a cabinet or she’ll maniacally dig around my office bin until she finds them. If she does manage to chomp down on a roll of tape, she takes off with it like a bat out of hell, racing to a safe space where she can be alone with “her pretty.” In true form, she was a little chomp-chomp this time around. If they really want to be front-and-center, they’re gonna get wrapped, too. Gift bags? They get in them. Bows? They chew them. 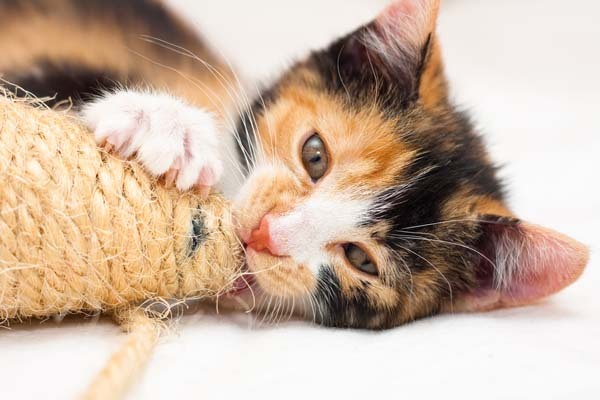 I no longer buy curly ribbon because Phoebe will eat it, which isn’t cool or safe at all (here’s what to do if your cat eats string!). For years my gifts went bow-less, until I discovered fabric ribbons. Sure, the cats occasionally try to chew on them, but they don’t get very far. Bags, though — they jump inside those suckers, whether or not they’re holding gifts that do not belong to them. Cats don’t give a rip. 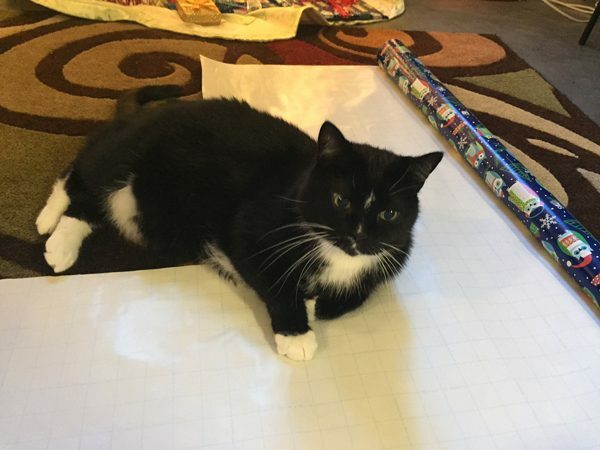 The kitties think the whole gift-wrapping situation is a game and are not-so-pleased when I don’t let them “win.” They enjoy standing in the middle of the supplies, looking for what they can play with and then get mad when I remind them they can’t play with all the supplies. To distract them, I’ve learned to place a few open bags and boxes near my workspace. I showed them that these items are fair game and they occupy themselves for a bit before they come back wanting to be front and center in my process. Cosmo should get a job with the TSA. For real. I finally finished wrapping my family’s gifts and, thankfully, they all fit into one cardboard box. When I ran for the packing tape, Cosmo decided he’d inspect my packing job. 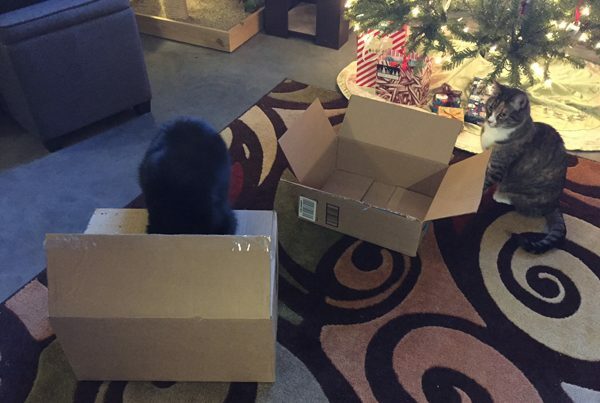 He was a thorough box-checker, and even tried to climb inside for an extra-close look. Either that or he was trying to stow away. I can’t say I’d blame him. Who wouldn’t want to stow away from the frigid Minnesota December to Florida’s sunny skies? Thumbnail: Photography © Image Source | Alamy Stock Photo. 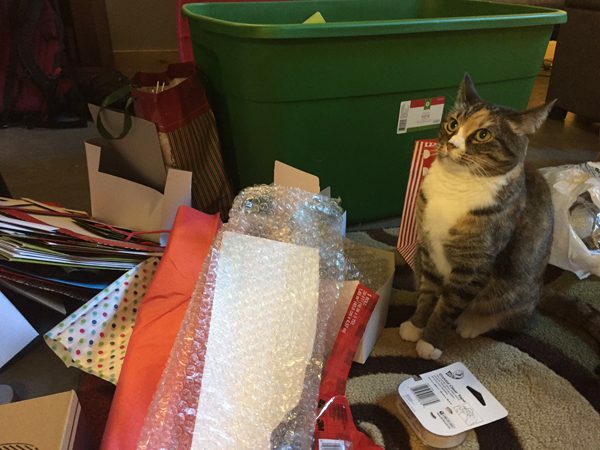 How does your cat hinder your gift-wrapping process? Tell us in the comments! My boy cat dashes through the workspace on the floor and bounces off the walls – the noise of the paper and scissors gives him the zoomies. 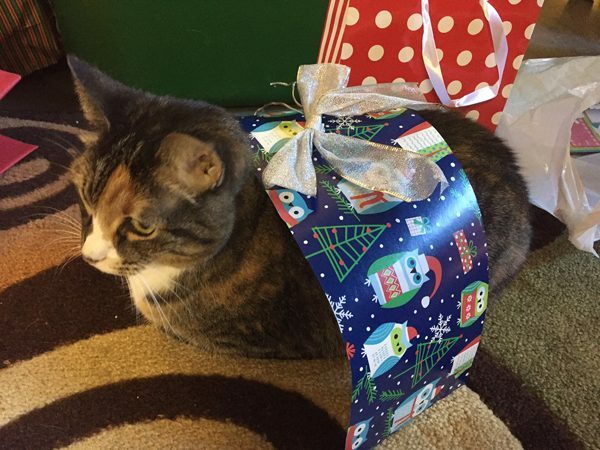 He doesn’t bother much with the actual wrapping process. My little girl, on the other hand, would like to help. I’ve learned to set a cardboard box near the workspace and toss all trash, scraps, store tags, and everything into the box. It becomes her “nest” and she plays in the box happily, especially as I keep tossing new bits of paper and things in on top of her! 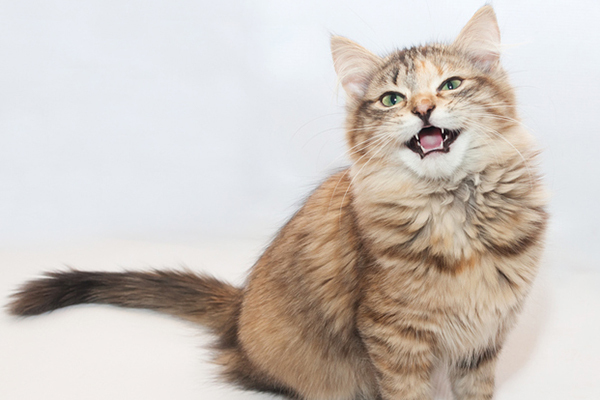 Funny cats! Mine are pretty good about Christmas wrapping but they do lie on the gifts under the tree. I’m a seamstress and I’ve never owned a cat who isn’t addicted to the tissue paper that sewing patterns are on. The tissue is thinner than ever these days so it’s a real problem. I throw them the trimmings of the tissue and they have to settle for that. Jeanette, mom of Tiger Monster, Simba, Iris, Pepper, Amos, and Tiki. My Tonkinese, Tater, is our official “Christmas Cat.” He LOVES to tear open presents and will help anyone who needs it. It’s hilarious! Then he pounces on the discarded paper and rolls around in it. He doesn’t give a hoot what is in the box he just tore the paper off, the paper is the thrill. Makes it easy to “buy” for him for Christmas, and inexpensive, too! I know why you say u don’t use string. 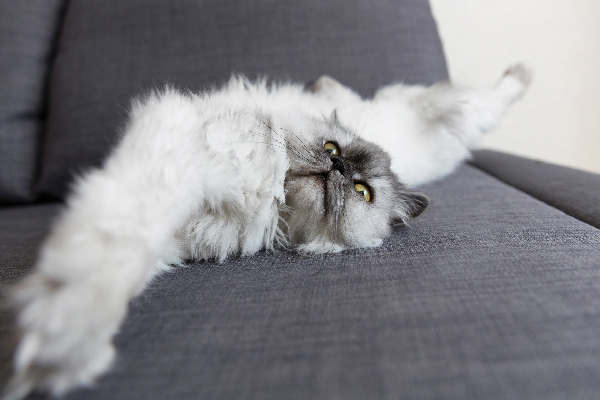 because for years cosmo and phoebe have wrapped you around their darling paws. and its been wonderful listening to the adventures of these little characters. and lets be honest. we wouldn’t have them act any other way. 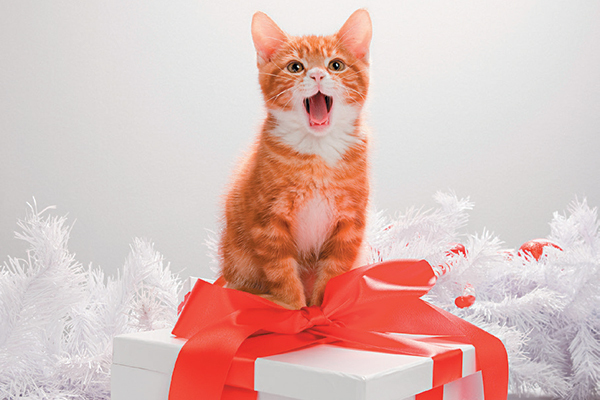 My cats are all over the wrapping paper and string. They’re either there, or under the tree napping.